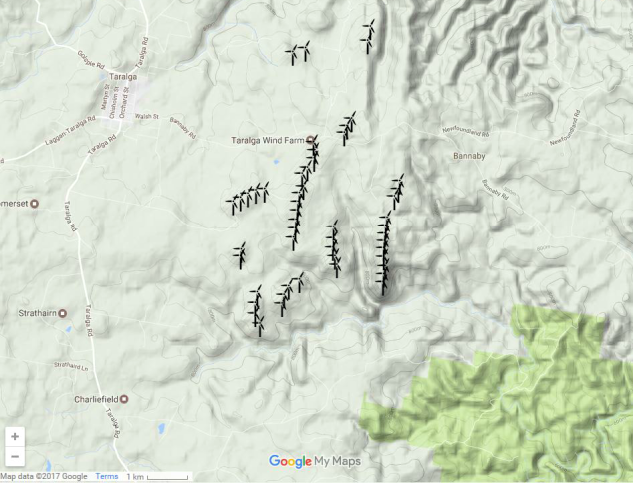 Taralga Wind Farm was developed by CBD Energy and Santander. It is a 106.8 megawatt wind farm with 51 turbines. The energy produced by the wind farm saves over 250,000 tonnes of CO2 emissions per year. The wind farm was fully commissioned and commenced commercial operations in June 2015. The layout of the turbines on the wind farm can be seen in Figure 1. I³ were the designer. AECOM provided support on concrete materials and structural issues. Dr James Aldred provided advice on the thermal performance of the massive foundation elements.